Pregnancy changes the body in many ways, resulting in some rather harmless annoyances like itching due to increased blood supply to the skin. 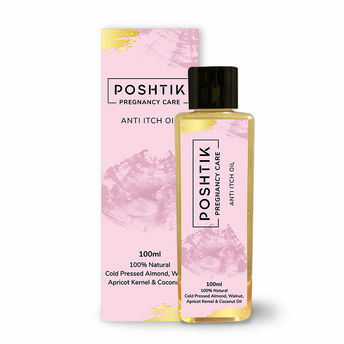 To address this issue, there is Poshtik Pregnancy Anti Itch Oil. It has a balanced mix of 100% natural cold pressed Sweet Apricot Kernel, Sweet Almond, Walnut & Coconut Oils which help reduce the discomfort during the course of pregnancy and post delivery. For best results, apply every morning from the second trimester of pregnancy, and post-delivery. Sweet Apricot Kernel Oil: This oil is rich in Vitamin A, E & C. It acts as a non-irritant and soothes the skin. Sweet Almond Oil: It contains lipids and softening fatty acids helps reduce irritation. Walnut Oil: Contains antioxidants that are vital for fetal immunity. Coconut oil - naturally anti-bacterial, anti-fungal, anti-inflammatory, antiviral and antimicrobial oil. Explore the entire range of Massage Oils available on Nykaa. Shop more Poshtik Pregnancy products here.You can browse through the complete world of Poshtik Pregnancy Massage Oils .